Taking Adempas Begins – a PH medication..
I’ve been living in a fog of a migraine since Friday. The day the Pharmacy nurse came to my house to explain all the ins and outs of the new medication that I was about to start taking. It’s called Adempas (riociguat <– don't ask me how to pronounce that!) and it treats two types of pulmonary hypertension in adults. You can read more about this medication by clicking on the red link. I’m so glad that K had bumped up our date night from that Friday night to the night before (Thursday) because I wanted to make sure I was feeling well rested for the whole fun experience of seeing Spectre in IMAX! It was so awesome! We even got two FREE movie posters for seeing it in IMAX which I thought was super expensive. But, hey, it was date night, right? It’s not often that I can get K to take me to a movie for date night. We already have our next movie picked out and we are both super excited. *drumroll, please* We are going to see Star Wars!!! I’ve waited 30ish years for this moment. FINALLY they made the Star Wars VII movie. I want to dress in character but I’m not sure if I’m going to yet. Wouldn’t that be so darn fun?? Ok ok… I’m getting way too distracted.. back to Adempas. So, like I was saying.. the nurse showed up at my house and we went through with filling out all these health forms. You know the ones… What medication are you currently taking, what medication are you allergic to, and then the fun ones began. I always dread this one category of questions: Health History. Are you serious???? Don’t you have that already in your data bank since I’m already taking Tracleer which is another PH medicine? Yeah, I seriously thought that. No, I wasn’t rude enough to blurt it out but I did take a deep breath (well.. as deep as I could, anyway) and started listing off the “most important” health conditions that I have. And then he took my blood pressure to get a baseline reading before I started taking Adempas. One of the side effects of this medicine, which could or could not occur is low blood pressure. All looked A-Okay with my blood pressure (I never had any doubts about that!). Then he did what I was hoping he wouldn’t do… he opened my medicine and had me take my first dose. *pout* I wanted to wait until today (Monday) so that I could have a relaxing weekend. It didn’t work out to be. The nurse took my blood pressure every 15 minutes to make sure it stayed within normal range. It did! Yay! Like I said, never doubted. haha! But something did happen later that day which made the whole experience blow. grrr! Maybe it was bad timing? Or maybe it is my body adjusting to this medicine. Since Friday evening, I have had an awesome sized migraine. I still have it. Usually they can last 3 days on average. If this is from Adempas, so far, this is the only noticable side effect, that I’ve experienced which makes me want to count my blessings. I’m starting out at 1mg, three times a day, 6 hours apart (I was hoping to start at the .5mg dose). Yep, I have to set my alarm to remember when to take it… and crap.. it’s almost time to take it again. Ugh! I am pretty sensitive to all the PH medicines. Tracleer has been the only PH medicine that my body has been able to tolerate. Hopefully, adding Adempas will give me good results and can be tolerated. Be well everyone and stay in touch. I have recently become a Guest Blogger at http://www.freshairmedicaloxygen.com (Fresh Air Medical). I answer questions and talk about oxygen there. I have not used them as an oxygen supply company but I’ve heard they are a good company to do business with. They have their customer’s best interest for their oxygen needs at heart and want to provide them with a community feeling with their blog. I’m glad I can help in this endeavor. The other day I approached K and said, “KK, I’ve been thinking..” KK is what I sometimes call him when, of course have been “thinking” and, naturally, when I want something. It never hurts to butter him up in preparation to offer an idea to get what I want. This has to do with our kitchen renovation. Now, K has all these plans in his head on how he wants the kitchen to look and sometimes he even includes my input but not very often. He’s just so, so good at putting colors and ideas together. I’ve learned to just go with the flow. Yet, I’ve had to reign him in at times when his ideas become too expensive. But here I am… thinking away with what I think is an AWESOME idea. Not only is it neat but it something that would greatly help me. You see, it’s become difficult to bend over or squat down to reach pans or containers in our lower cabinets. It makes me tired and/or short of breath to reach into the lower cabinets while bending over. So, I wondered if K could fix this problem with my idea. 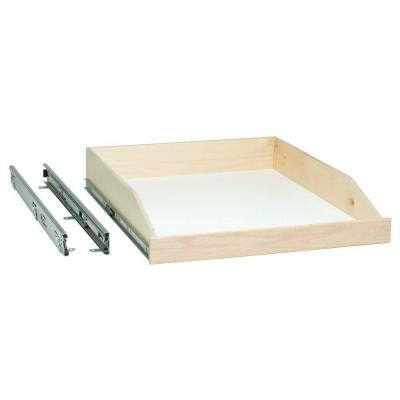 I was standing in the computer room/craft room of our house when I asked him, “What do you think about the idea of installing slide-outs in the bottom cabinets so that when I need a pot or pan (whatever I need), it will be easier for me?” To my surprise, K turned towards the computer that he was already sitting at and tapped a few keys on the keyboard to bring up a website. It was the Home Depot site and he was showing exactly what I just asked him for. He said, “I thought the same thing and I was about to order them.” I told him that he’s so awesome! The full slide out cabinet drawers that we ordered. K tries so hard to make life easier for me. If some task is harder for me now, either he or I will figure a new way to do it so that it won’t cause me as much trouble breathing. We are a team with a common goal. And that goal is to keep me around for a long time. That means, to make life a little more accommodating isn’t such a high price to pay. I’m so excited to show you what I finished yesterday on my own. 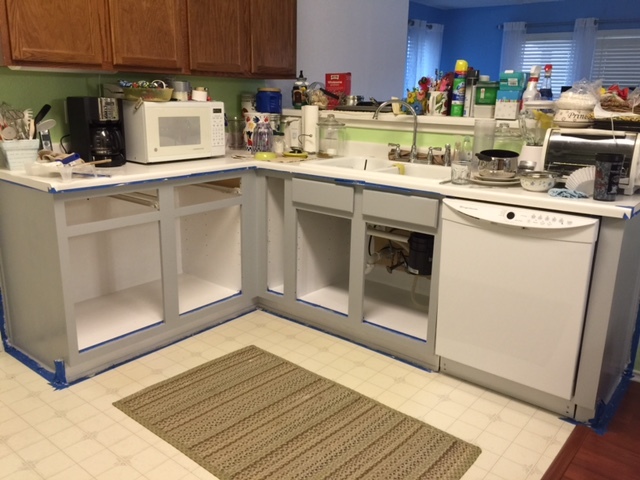 Ok..ok.. it actually took me nearly three days to finish both priming with a special bonding primer and then paint the cabinets. Please disregard the mess. It was so hard to find space for everything that was originally in the cabinets. That’s why we are doing a section at a time. Plus, I have to go slow to not wear myself out. And, yes, K had to empty all the cabinets out for me. 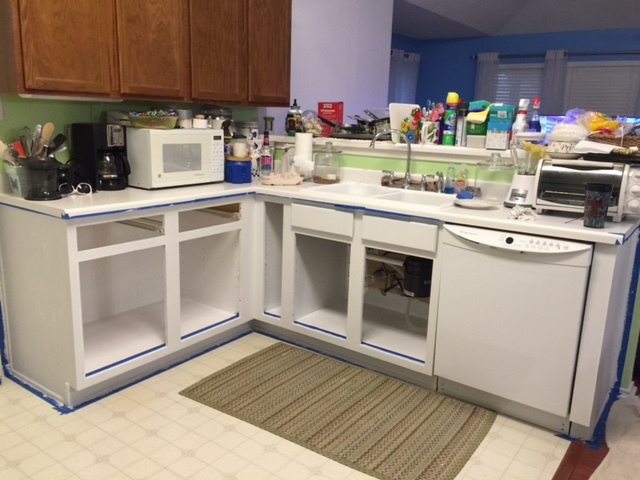 He painted the insides of the cabinets. He didn’t want me surrounded by paint fumes… even though we used LOW odor Valspar paint. This is an example of something K and I do as a project. Some projects that we do are too hard for me physically. So, my job is to be the budgeter or researcher. It’s just like the trip we took to the Arboretum. We took a lot of pictures together and later, I may make another Shutterfly photo book from those pictures. I mean, what better way to capture a lifetime of memories than in a Shutterfly book? We build memories and keep the relationship between K and me happy. It’s also helps to keep me active and my health stable. 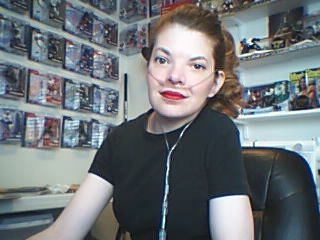 Even though I use oxygen and my lung volume is in the teens, I still find things to do that I enjoy. Oxygen doesn’t take away the joy of life for me. I use it to my advantage so that I can find a lot of hobbies that are super fun to do! Doctor appointment & medicine update! I’ve been keeping myself busy with my fun garden which I’m growing in pots near the back door of my house. 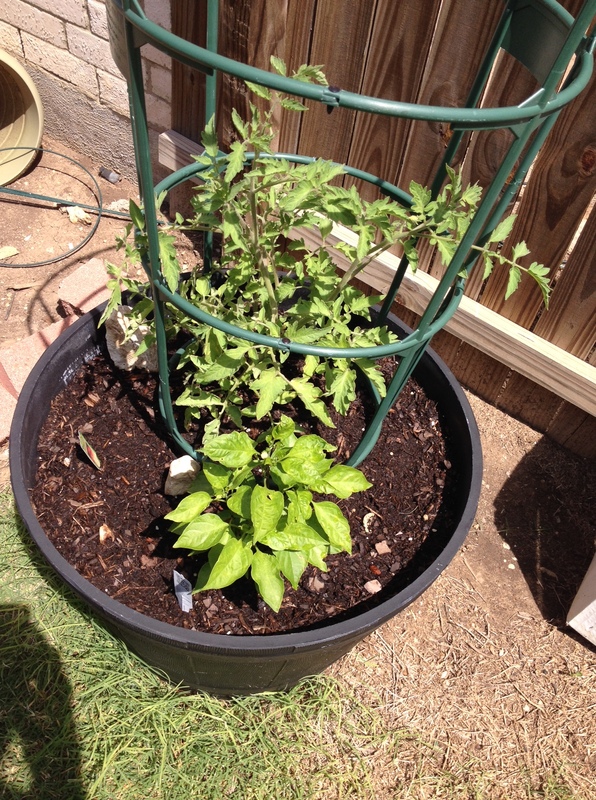 I’ve added more herbs and I’ve attempted strawberries but I think only one strawberry plant has survived. My raspberries tastes awesome! I’ve not given up hope yet! The day is so beautiful outside. So, my windows and back door are open until it starts heating up to the point I can no longer stand the heat. I’m sure it won’t be long. After all, I live in Texas. But all that aside, I wanted to tell you that yesterday I went to a new doctor. He’s a cardiac electrophysiologist. I sure hope I got his title right! His title takes up the whole left side of his doctor coat with the MD and PhD added to it. The big reason I chose to go to this new doctor was because of the current cardiac medicine that I’m taking and have been taking for the past 20+ years. It’s called Cordarone (or amiodarone HCl). This medicine is used specifically for ventricular arrhythmias. It also has a pretty bad side effect of possible Pulmonary Fibrosis. I have been very lucky to not have developed this so far… but my ability to breathe has been getting worse over the years and really, I don’t want to be taking a medicine that could potentially be harming my lungs. That is why I went to see this doctor. I wanted to know if there were any new medications out that I could take for my arrhythmia problem. Luckily for me, there is a new medicine out and of course, wouldn’t you know it… it’s a “Specialty” drug called Tikosyn. Not only that, to be able to start taking this medicine, I will have to stop taking my Cordarone for two weeks and then be admitted to the hospital for three days. It’s the only way the doctors allow patients to start this medicine. It’s because the patient has to be connected to an EKG to be monitored to determine the correct dose and to make sure the person’s body will tolerate the medication. The patient information packet that I was sent home with to study was geared towards people who are diagnosed with Atrial Fibrillation/Atrial Flutter (AF/AFL). That confused me because I have what I’ve been told is called Ventricular Tachycardia. Once I figured out that Tikosyn is a general purpose Arrhythmias drug, it only made me feel a tiny bit more comfortable with the possibility of this drug. It’s all a little scary to me. I haven’t decided on if I will do it but I’m leaning towards it. K is letting me decide this but I think we are both playing this off as a possible mini-vacation for him. LOL! Don’t get me wrong! He will be worried about me. He’s a great man. Right now, I’m trying not to think about it other than for this post on my blog. I just thought you’d like to know what’s going on. I’m also still on the new PH medication called Opsumit (macitentan). I am doing a lot better on this go around. I had taken this medicine for the first time only for a week when I must have developed a sinus infection and had to stop the medicine for a whole week. I’m now restarted on Opsumit and am on the 5th day with no serious sinus problems and only a twinge of a bad headache occasionally. I think I will be okay on this stuff. If it helps my aorta artery and my breathing ability, then it will be worth it. Plus, there is the bonus of only needing to get lab work done once every three months now. That rocks! I’m so looking forward to heading to Oklahoma to see my family. That means if I decide to try Tikosyn, it won’t be until sometime in June, after having all the fun I can have with my family. Besides, I don’t want to be off Cordarone while away from home and away from my doctors. To me, that’s risking a little too much. I’ll play it safe! Don’t forget to follow my blog so you won’t miss anything! I haven’t forgotten the “Need a Hug” giveaway! I’m making the afghan and it will be finished very soon! I will get a preview picture up soon. Here are the pictures I took of my garden this morning. What do you think? 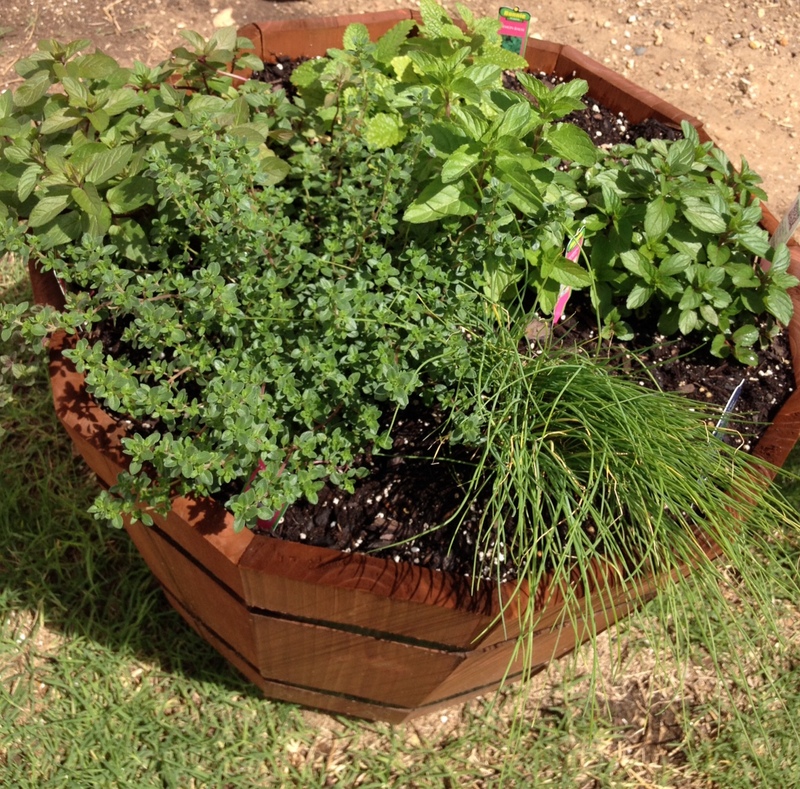 Herb garden in a pot with: chives, lemon thyme, spearmint, lemon balm & peppermint. 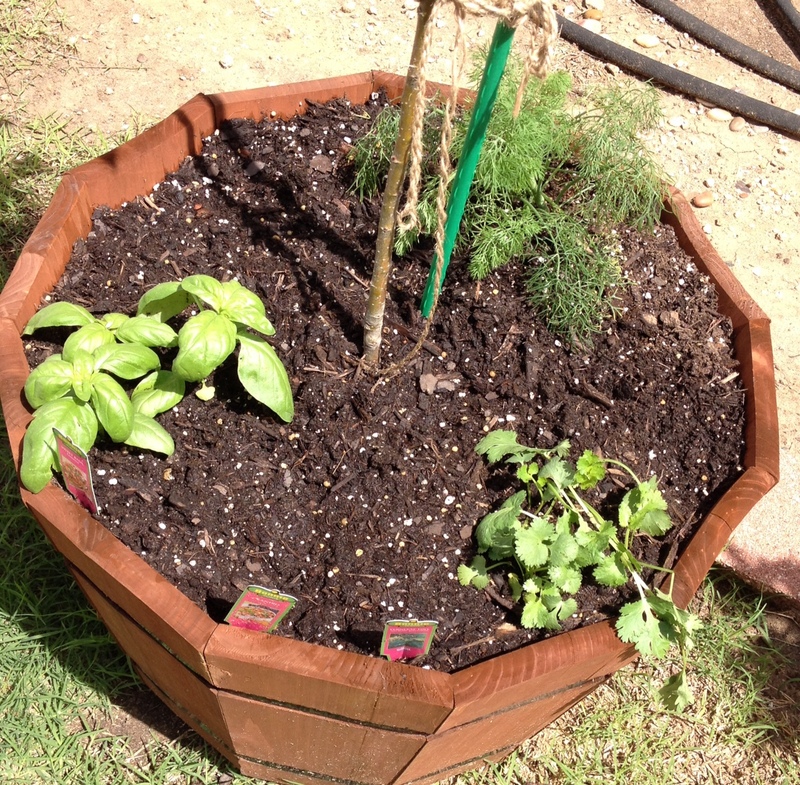 Newest herbs in my 5-in-1 dwarf apple tree pot: basil, cilantro, & dill. Drama here, drama there, drama everywhere…. I know my husband, K, loves me when he leaves that last remaining bit of soda in the bottle just for me. What a GOOD man! Not only that, he actually brings me my favorite flavor of ice cream home when he notices that I ate the last of my stash. Not every time, mind you. Just enough to qualify him for the “GOOD MAN” status! PLUS! 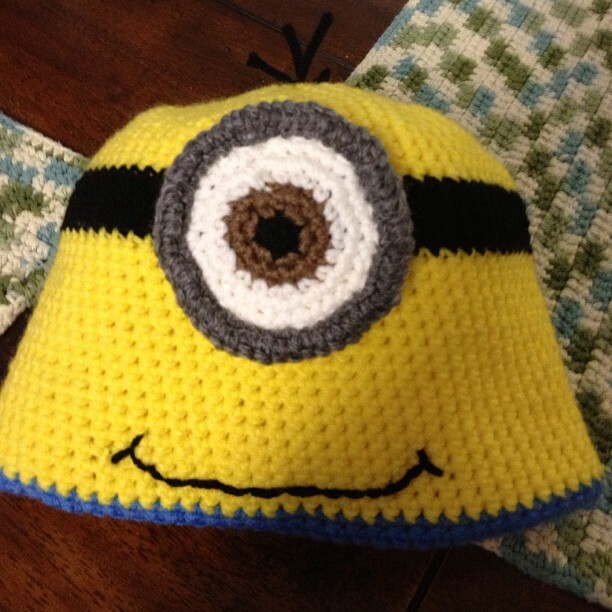 He nodded politely when I showed him my progress on my Minion hat I’ve crocheted. It was my first character hat I’d ever made. I don’t think he was terribly interested in it but he was acting like it and THAT’S what mattered to me. Next, the pup barfed in my bed and all that day Rocco had coughing fits off and on. As a good mommy that I am, I worried like crazy. What do I do???? I ended up feeding Rocco a piece of bread slowly. Low and behold, it stopped his coughing for hours. He’s doing pretty well now (3 slices of bread later) and he’s got a vet appointment tomorrow. Which is another little problem. I may have to get Rocco to the vet alone. I just don’t know if K will be home in time to take us. It wouldn’t be so bad if Rocco was a calm pup with the vet. But enough of all that! The weather, as miraculous as the rain is, is causing me a bit of trouble. It was 102 degrees the other day and now it’s only 70 degrees (F) with rain. It’s humid outside. I hadn’t been outside longer than enough time to check my lime & lemon trees. Going out to pick up my medication at the pharmacy was a struggle. The struggle was with the humidity which was causing my head to hurt. My poor lungs felt like it was trying to breathe in dense, steamy air. I came home straight from the pharmacy to regroup and recharge! The good thing is that I got out of the house today. That felt great! Yesterday, I actually stood outside in the rain because it hadn’t rained in nearly a month. It was SO glorious and it felt so good. I don’t mind getting sprinkled on… rain won’t make me melt. Sign up to follow my blog. Get email notification for each new post I make on my Living On O2 for Life blog. Be well everyone! Life is starting to calm down for me again. I made it through the doctor appointments and even the over-night sleep oximetry test. I don’t have the results back yet but I know when I get up out of bed without my bipap and oxygen on, my saturation drops to 75 within about a minute of time. Yikes! I’m still awaiting word from my health insurance about whether they will approve Tyvaso for me. I read that it costs about $100,000 annually for this medication. I’m not sure how that price is justified. It’s highly outrageous. All I know is that if or when (gotta stay optimistic!) the insurance approves Tyvaso for me and I start taking it, there is suppose to be someone who comes to my house to teach me how to work the battery powered inhaler. I’ll have to do this inhaler 4 times a day, 4 hours apart. My husband tells me that I should start setting timer alerts on my cellphone so I won’t miss a dose. I am so terrible about remembering things. I hope everyone has a lovely week. 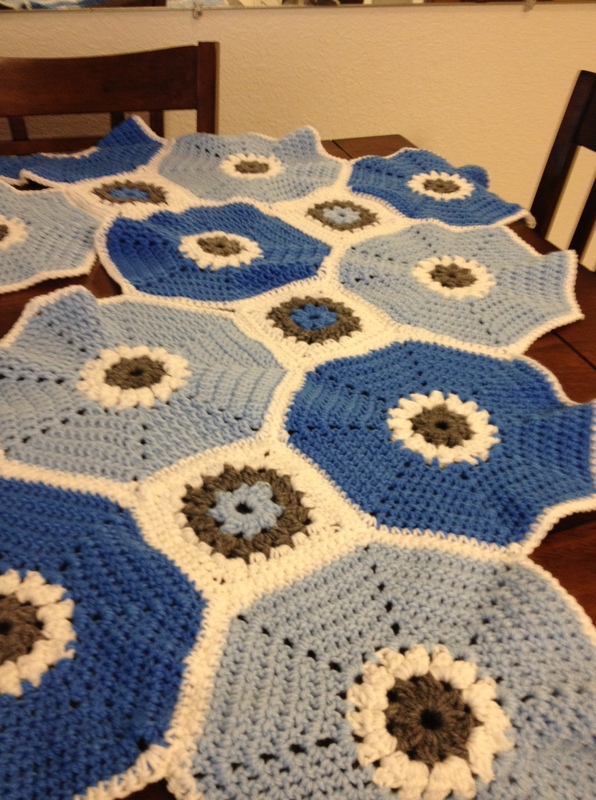 I’m finishing up some of my afghans. One for my sister and one I’m saving for an auction. I’ll be starting a new one soon. Below is a picture of the one I’m making for my sister. I’ve got all of the pieces sewn together now. Don’t forget to FOLLOW my blog! One day when I was about 6 or 7 years old, I was lying on the carpet of my parent’s family room watching television. A commercial came on and it was for the Duracell battery. Back then I was really into commercial jingles. I pretty much knew them all and sang along with the commercials. You remember the “Ding, ding, DONG!” of the Duracell ad, right? The coppertop battery! Well, it was on this day that this commercial came on that, for some reason, I had placed my hand over my left ear during the “ding, ding, dong” part (well it was SO loud, wasn’t it?). I made a huge discovery. My right ear didn’t work so well. I tested my left ear and it worked just fine. So like I said, I’m only 6 or 7 years old – making this discovery on my own – and I’m about to let my mom know my big news! I’m telling my mom the big news and she’s like wearing this facial expression that’s hard to describe. It reminds me of the Seinfeld tv show when the phrase, “Serenity Now!” was popular. I’m her child and she’s been through so much with me. There was the tube feeding from one month old when she finally was able to bring me home from the hospital, my first spine fusion with the halo traction, and all those doctor appointments in between the heart catherizations. Now, it was my ear?? That was something unexpected. So, it was another round of doctor appointments and a surgery that fixed nothing. Now, I’m without hearing in my right ear. It’s funny though because my sisters grew up with me like this and they still forget that they have to walk on the left side of me so that I can hear what they are saying. I’ve had many challenges in my life but this one makes me laugh every time I think about the Duracell battery commercial. Don’t forget to FOLLOW my blog!